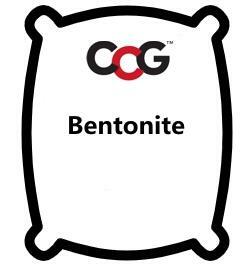 Bentonite is a highly plastic clay originating in the decomposition of volcanic ash. Is extremely fine and can be dispersed widely through bodies and clays. In which it is used to impart plasticity and ability to keep a glaze slop in suspension. Up to 2% can be safely added to all bodies and will improve plasticity. Plasticity: Because of their active electrolytic behaviour and fine particle size, bentonites exhibit extremely high plasticity (and associated high shrinkage). In pottery and porcelain clay bodies additions of only 2% can produce marked improvements in workability and dry strength without much effect on fired colour. The use of up to 5% is common, especially where high plasticity is needed it a white burning body. High amounts of bentonite will dramatically slow down the drying rate. In certain applications it is practical to use bentonite as the only plasticizer in a mix (e.g. 5-7.5% with Redart to make a terra cotta). The plasticity-producing effects of bentonite depend on the shapes, sizes, surfaces and electrolytics of the particles it is interacting with, equal additions of bentonite to two different host bodies may have much different effects on the plasticities. While bentonites can be called upon to assume the major burden of plasticizing a body, there is a need to assess the practicality of this (the body can become excessively plastic, take too long to dry and be too easily torn).